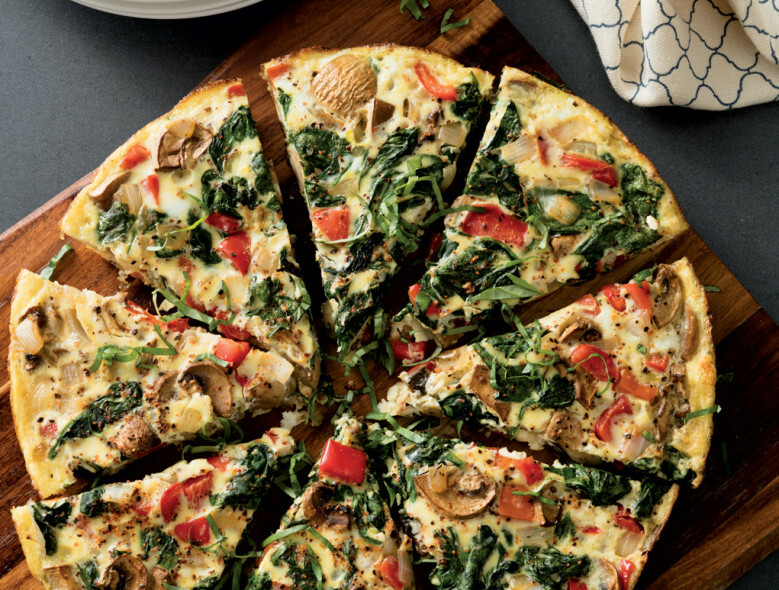 This frittata is a great way to get more veggies into your day and can be enjoyed for brunch or dinner. By using a combination of egg whites and whole eggs, you cut back on some of the saturated fat and cholesterol. Add olive oil to an oven safe, non-stick, sauté pan over medium high heat. Add mushrooms and sauté until all of the liquid from the mushrooms is evaporated. Add bell pepper, onion and spinach and sauté until vegetables are softened and liquid is evaporated. Whisk eggs, egg whites, milk, salt (optional), pepper, cayenne pepper and basil in a medium bowl. Pour over vegetables and stir until eggs start to set. Smooth the top of the frittata with a spatula, and put in oven to bake for 20 minutes or until eggs are set. Slide the frittata out of the pan onto a plate and slice into 8 pie slices.